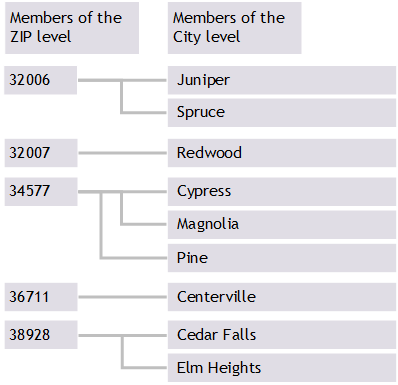 Hierarchies are a natural and convenient way to organize data, particularly in space and time. For example, you can group cities into countries, and countries into regions. In such cases, it is useful to be able to query for the child cities of a given country, or to query for the parent postal region for a given country. A cube defines the hierarchies among the levels, and MDX provides functions that enable you to work with the hierarchy, so that you can write such queries. In InterSystems MDX, if you omit the hierarchy name, the system assumes that you are referring to the first visible hierarchy in the given dimension. To determine relative positions, the system uses the default order of the members within the level, as determined by the cube definition.